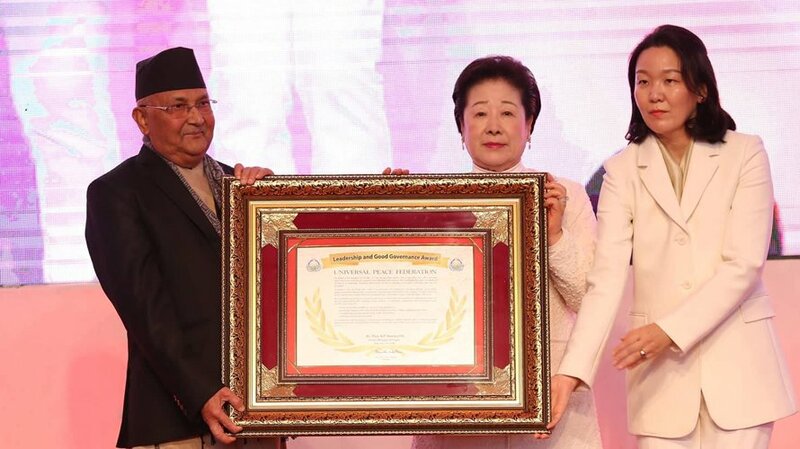 Prime Minister KP Sharma Oli receives the Leadership and Good Governance Award from the controversial Universal Peace Federation, in Kathmandu, on Sunday, December 2, 2018. Katmandu,Dec 03:The Himalayan Times reports in its lead story that Prime Minister KP Sharma Oli received USD 100,000 in the award from the controversial Universal Peace Federation, but it has also raised a serious ethical question. Kantipur says many leaders of his Nepal Communist Party have expressed their dissatisfaction over the PM’s decision to accept the award. Naya Patrika reports that the award cannot be evidence of his good governance as it was decided just after around four weeks of his appointment as the PM. Rajdhani claims the organisers of the two-day event have also called the PM to make Nepal a Christian country. It also adds that the main opposition party, Nepali Congress, has vented ire over the issue.